Adele Carryer says she knew they were in trouble when Chevy, right, pushed her under the water in panic. Her son Keegan managed to keep old girl Kune, left, afloat. Adele Carryer urges people to be careful in the water following an incident where she, her son and their two dogs were caught in a “tumultuous” rip in Ōrewa Estuary on Sunday March 24. While the Red Beach mother and her 23-year-old son Keegan only received minor injuries and their dogs are okay, Adele says people need to be aware of the dangers. “My son and I are confident swimmers, so it’s hard to image what may have happened to someone else,” she says. 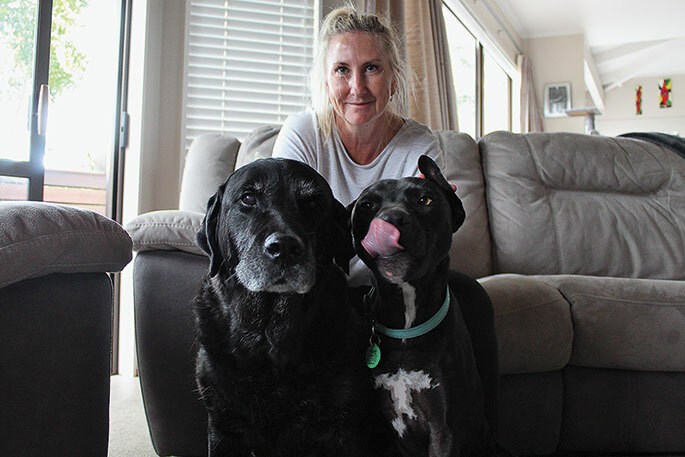 Adele and Keegan were exercising their dogs in the Estuary shallows around noon when their 14-year-old Labrador Retriever, Kune, chased a seagull into the rip. Adele ran in to save her, followed by Keegan who was worried that his Mum would not reach Kune in time. Chevy, the family’s one-year-old Staffordshire Pointer cross, followed suit, resulting in Adele and Keegan both trying to hold a dog afloat while calling for help. A witness called police, who contacted Ōrewa Surf Lifesaving Club. Lifesavers Faron Turner, Conan Willis, Curtis King and Pippa Cunningham, had the family safely on the beach four minutes later. While calling 111 is his first recommendation, Surf Lifesaving Club president Faron Turner recognises that in some cases, people may need to enter the water. “We are working with Drowning Prevention Auckland to have permanent angel rings situated around the Estuary for situations like this one,” he says. He also says rough rips make it difficult to follow the traditional advice of relaxing and riding the rip out, emphasising the importance of calling police promptly. He says lifesavers get no specific training on saving pets, although there are more animals rescued at Orewa than you might think. Adele says she is extremely grateful to the “caring and calming” surf lifesavers and to the people who phoned the police.